What is the quality on the Ranger metal file/saw? The metal file in combination with a plier is very good and it is many times misunderstood as a tool only for metal. It is not only for metal and I would say that this tool is one of the absolute best for wood as well, it can be used for surface work on wood and for shaping. The metal file/saw on any multi-tool is usually made to be a durable tool and from what I have heard and know it is the same with Wenger. I have for sure tested a few things myself. I found a bolt that is made of an unknown metal alloy or steel and it was cut without any problem. The metal file is short and therefor some may wonder if it would take very long to cut. It did not take very long and it survived. Then I found an old steel padlock, not the best quality but it would need a good hit with a stone to open it without keys. It was cut without any problem and the teeth are intact, only a few changes. Remember that the metal file on SAKs is made to be close to a professional tool but it cannot replace the specific professional tools. It will for sure help you and perform when needed. I am a bit surprised by this and I see that I will do some more tests for fun and to get more knowledge on this tool. There are three sides on this and one side is more comfortable because it is on the side close to the handle. This metal file/saw will cut even better padlocks, chains and metal. 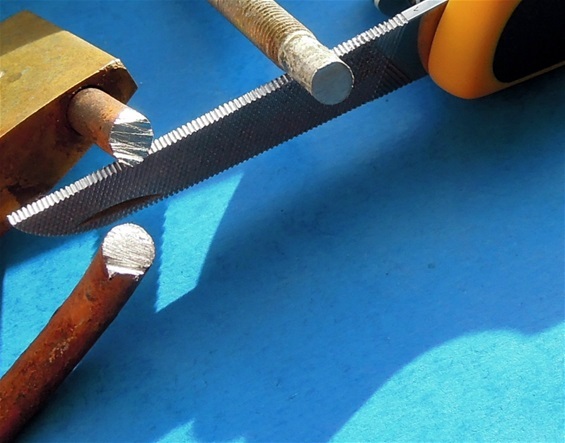 A metal file is excellent for removing rust and corrosion on metal. All the rust must be gone before painting it. There are paints today made to be used directly on rust and corroded surfaces. It is better to do it proper and removing all rust will avoid the small bubbles from a coarse rusty surface that in time will open for further corrosion. 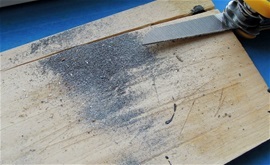 The metal file is cross cut and it will work in both directions. It is the same with metal and wood with the amount of pressure you put on the surface. It is a sturdy shorter tool that is strong made. The amount of pressure you put on will influence how much you file off metal or wood material. The angle towards the surface will also influence the performance. On wood it is possible to get an ok surface with light pressure. It is a nice tool to have before sanding for example. That sad it is important to know that a file is a multi-tool on its own. This is because it can be used on metal, wood, plastics and bone. 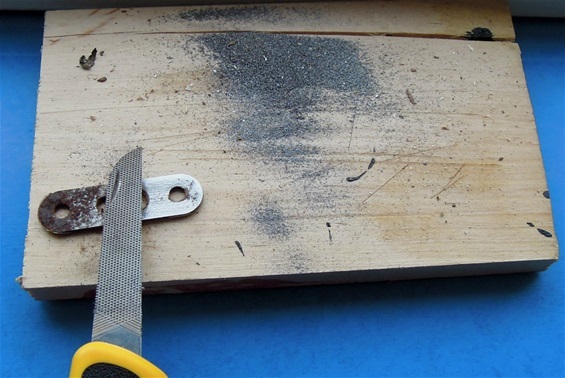 A file/saw can be used for making notches is different materials for string or rope purposes. For survival it is important to remember this. It can be used for much more than metal. The advantage with a wood saw is that it can take the load off the main blade. It is the same with a wood saw, it can be used by hunters dressing animals on bone. It can be used for many more materials than only wood. It is a perfect tool to be used on thick rope. You can cut the thickest and strongest rope with a wood saw. 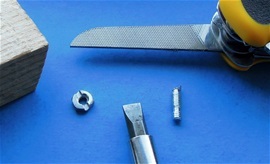 The metal file/saw can relieve the blade as well and it can be used in combination with a plier or relieve it. Very little changes on the metal file/saw but much remains from what it was used on. I have also used it on Fishing Equipment and things in the house! Not easy to see that these functions are used. It is high quality made because you can feel it momentarily when using it. This does not slide over metal without taking with some from the object you use it on. Because it is short there is space for the can opener at the other end. I already knew the quality on this from tests and more. This will perform without any doubt. One thing you can discover very fast with metal files/saw is when you use the saw and cut a piece of metal is the tracks that happens on the sides. This did not happen on this! The metal file/saw really works well on Firesteels. It makes more sparks than normal. Because it is I short and is close to the handle then it is usable for such tasks. Maybe I would not use this regularly. The metal file/saw is a multi-tool in itself and can be used in the outdoors and in the house. On the Firesteel you can use the narrow saw and it sends off sparks. The file sides works as well. For survival and in situations I would not hesitate using this tool. I would wish that one side of the New Ranger metal file had a fine surface for use on fishing hooks and for sharpening other knives. If you study the world of multi-tools then you will discover that this has been and are used. It is an advantage but not a problem. The cross cut metal file on the New Rangers can be used for sharpening large fishing hooks, on a gaff it works extra well. For sharpening fishing hooks it is not the best. It is a very good file to be used for metal work and on wood. It can be used to make notches is screws and bolts. In combination with a plier the metal file/saw is extra well. What did surprise me the most is the ability it got to dig into metal and cut steel rods and bolts. There are for sure limits to what abuse is and what the average use is. There are plenty more used and different tasks that would require or could require a file. The metal file/saw can be used to clean the electrode on a spark plug, this important! A knife blade, metal file/saw, screwdriver and a plier can be valuable for work on engines and a spark plug. A metal file/saw is a multi-tool in itself and there are different philosophies out there. It is about picking the correct tool for you and your needs. That is why there are many different models. My biggest advice for people is to have a backup or to have a philosophy that requires two tools separate as well. One tool in each hand must not be under estimated. Not all multi-tool enthusiasts would agree because one tool with its functions should be enough. if i remember correct the surface on this is from a file, then i used the finer ones on the picture to gradually develop a finer and harder surface. If you are into survival fishing or making fishing hooks from different materials found in the nature and things left by people then I recommend the internet. There you will see just how innovative people are and that a set of pliers and a metal file/saw can be used for numerous things. You can make fishing hooks from many materials. A nail can be used with success and if you use time then it can become a good hook and you can put on different fabrics and plastic to lure the fish. There are some things you can do in a situation when you do not have a plier. If you have a metalfile on any SAK and can reach a nut then you can use it. Cut the extra length on the screw and make a notch in the nut with the saw. If someone says it cannot be done then this picture speaks for itself. Make the notch or cut deep. When you turn there will be or may be the need for using the saw again on the screw. The left overs will not be a problem usually. Remember when you cut the length first that you use some care so the pressure does not deform the screw so it is difficult to unscrew. It certainly did work out!